http://poppyroadreview.blogspot.com is the link. 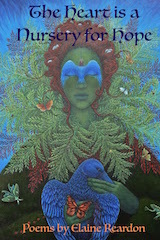 Sandy Benitez, Flutter Press, is giving away 10 copies of my chapbook, The Heart is a Nursery for Hope. Go check it out, and thank you for visiting! Elaine.